Stocks that grow your investment 20-fold don't come along often, but some big winners in the tech space have done that and more. Stocks that turn $10,000 into $200,000 -- even over the course of 12 years -- are few and far between, but they do exist. I found four tech stocks that have generated returns at least that good for investors since the start of 2005. 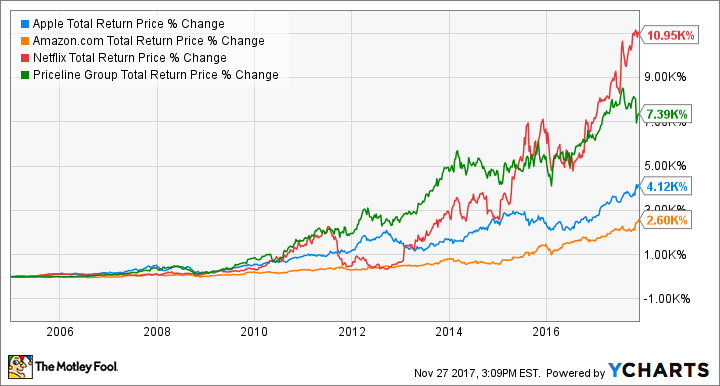 Below is a chart of the returns of Apple (NASDAQ:AAPL), Amazon (NASDAQ:AMZN), Netflix (NASDAQ:NFLX), and Priceline (NASDAQ:BKNG) over that period. A look at how these companies produced such tremendous returns might give us some hints about where similarly outsize profits might be found in the future. Apple may be the iconic company of the decade: Its trailblazing iPhone and iPad have defined mobile computing since they were launched. What drove Apple stock's stellar returns was the massive addressable market for these products, and the stickiness of its ecosystem. An iPhone user is more likely to buy an iPad, Mac, or Apple TV than competing products because of the confluence of iTunes, the App Store, and Apple's cloud services. And we know all Apple Watch buyers have iPhones too, because they smartphone is necessary to operate the wearable. Apple's days of growing revenue by double-digit percentages year after year may be behind it, given its size, but I don't see people shifting away from Apple's products in any rapid way in the future, so its earnings power should remain strong. And looking at the next generation of products it has on the way, such as the cellular-network-connected Watch and AirPods, gives us a small peek into a post-smartphone world where Apple may still be a dominant company. No company has ever upended retail quite the way Amazon.com has, and that's led to one of the biggest tech disruptions in history. It has become a massively successful a retailer, and a platform for thousands of other retailers, leveraging its network of Prime users around the world. It has used that strength to expand into connected devices like Alexa and its own streaming television studio. What has really excited investors recently is its cloud subsidiary, Amazon Web Services (AWS). This is a platform that other businesses (including major names like Netflix and Snapchat) can build on, rather than operating their own servers. AWS has generated $2.18 billion in operating income in the first nine months of 2017, more than twice the $749 million Amazon raked up in operating income from retail. With its retail channel and AWS both booming, there's no business that's safe from Amazon's disruption. In 2005, Netflix was a DVD-by-mail rental company with an uncertain future. The internet was making video distribution easier and it was hard to see how DVDs could stay relevant. But Netflix met the challenge of that evolving environment head-on, developing one of the first streaming platforms, which it bolted on free to its DVD delivery subscriptions. Today, we hardly remember the DVD delivery business, and Netflix is synonymous with streaming video. Among the most powerful aspects of Netflix's business model is that its monthly subscriptions give it consistent cash flow with which to acquire content. Early on, that meant buying content from other studios, but now it means developing its own series and films, which Netflix has gotten very good at -- think House of Cards, Stranger Things, and Master of None, to name a few. With more content moving online and Netflix building a deep catalog, it looks likely to be a dominant media company for a long time to come. Online travel agencies have been booming for more than a decade, and Priceline's suite of websites make it the industry leader. It owns Priceline.com as well as Booking.com, Kayak.com, and even OpenTable. If you need reservations for anything from a hotel room to a car to dinner, Priceline is a great place to go. Its ecosystem of service providers and customers will be difficult to disrupt and Priceline has been willing and able to acquire potential disruptors before they become too big. When you combine its dominant market position with the growing number of customers who automatically go online to book services, you have the recipe for Priceline's continued success. What these stocks have in common? The common thread here is that each of these companies took an early leading position in a new industry with a massive addressable market. The smartphone, online shopping, streaming TV, and online booking of services are now commonplace, and Apple, Amazon, Netflix, and Priceline were pioneers in each business. That's how they've driven massive returns for shareholders.